Within the 23,000 acres that comprise the Kapalua Resort you'll find the Ritz-Carlton, Kapalua, the Montage Kapalua Bay, and the Kapalua Villas Maui. Both have access to the resort's Kapalua Beach, Oneloa Bay, and Fleming Beach and to two championship golf courses, one along the bay, another up and down the mountains and a third through what used to be pineapple fields. The tennis activity takes place at the Kapalua Tennis Garden, a lushly landscaped complex of 10 tiered Plexipave courts. The Ritz-Carlton, Kapalua opened in 1992 on a hill overlooking Honokahua Bay and its white-sand beach. Atypically for Ritz-Carlton, which is usually drawn to European style, this 548-room hotel derives its architectural and decorative inspiration from the Hawaiian islands themselves. The interiors hint at elegant plantations, with wood and stone, an open, airy feel, and original art depicting scenes of Hawaii or Hawaiian history. And while Ritz-Carlton couldn't resist installing chandeliers, those in this hotel and their matching wall sconces have been designed to suggest foliage. There are two additional options, all with villa or luxury home choices: the Montage Kapalua Bay, a complex of 280 one-to-three-bedroom villas with views that vary from golf fairways to full ocean front as well as a selection of luxury homes; and Kapalua Villas Maui, which has 2- and 3-bedroom villas, some of them oceanfront overlooking Oneloa Bay. The Tennis Garden is renowned as one of the most beautifully situated court complexes in the country. Its 10 hard courts spill down terraces in the side of a hill with views west across the former whaling anchorage called Lahaina Roads. Tennis Staff. Jason Purcell heads up the tennis staff. 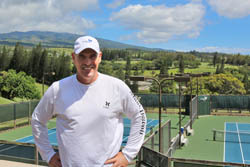 A veteran professional with more than 25 years of coaching and program development experience at high performance tennis programs, country clubs, and luxury resorts, Purcell comes to Kapalua from The Phoenician, in Scottsdale, Arizona, a resort he had helped shepherd to a USTA National Outstanding Facility of the Year Award in 2015. He had grown up in Arizona, playing college tennis for Division I Northern Arizona University, twice serving as its captain. Tennis Programs. Since coming to Kapalua, Purcell has beefed up the weekly calendar to include what is now a daily 75-minute "live ball" drill—limited to a maximum of 6 players—that focuses on technique and tactics while maintaining the dynamism of a playing situation. Three times a week he stages a drop in doubles social organized by one of the pros. Those and the clinics he finds are the best ways for guests to find other compatible players. "We encourage our resort guests to participate and view all our programs," he told me. "This allows them to make new and complimentary tennis connections, playing arrangements, and clinic partnerships during their stay on the island." Beyond that, there are seasonal junior clinics for various ages and abilities and custom-designed camps for groups, large and small. Courts & Fees. The Tennis Garden has 10 hard courts, four with lights. Court fees: $25/person/day if you're staying at the resort (multi-day passes that include court time, clinics, and more are available). Caveat: Annual rainfall at Kapalua averages 70 inches a year—this part of the island wouldn't be so lush otherwise—but you can use those rainy days to visit Lahaina or the moonscape crater of 10,000-foot dormant volcano Mt. Haleakala. Beach. Four white-sand beaches fringe the resort property: Oneloa Bay, D.T. Fleming Beach, Honoloa Bay, and what many regard as one of the finest beaches in American, Kapalua Bay. Golf Courses. The resort has 36 holes of golf, all accessible to guests of either hotel. Plantation Course: This most demanding of the Kapalua courses was designed by Ben Crenshaw and Bill Coore to take advantage of the expansive vistas, sweeping slopes, deep valleys, and native vegetation. Difficult greens, breathtaking views, wind, and the occasional sight of whales breaching in Lahaina Roads to the west all add to the challenge. It now hosts the annual Kapalua International stop on the PGA Tour. Par: 73. Length: 5,627-7,263 yards. Bay Course: This earliest of the Kapalua courses debuted in 1975. Arnold Palmer designed it, providing generous and forgiving greens as compensation for the distracting scenery. Par: 72. See the website for rate details. There are 50 one-to-four-bedroom suites, all with fully equipped kitchens. Rates vary by size and view and do not include taxes or resort fees. One-bedroom rates are for up to a maximum of four people. Two-night minimum bookings apply. See the website for details.